BOSTON, Mass. 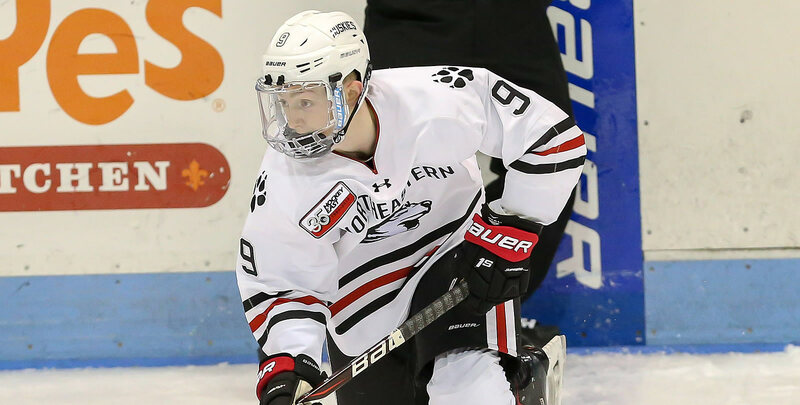 - In front of a sellout crowd of 4,803, freshman Tyler Madden sent the fans home happy in the opening minute of overtime, roofing a backhand over the shoulder of UMass goaltender Matt Murray to the give the No. 8 Northeastern men's hockey team (15-5-1, 9-3-1) the wild 2-1 victory over the No. 1 Minutemen (18-4-0, 10-2-0) on Saturday night at historic Matthews Arena. The win is Northeastern's first over the No. 1 team in the nation since Oct. 13, 2012 and the eighth of all-time. It also moves the Huskies back within one point of first place in the Hockey East standings and gives NU a 13-3-1 mark in their last 15 games. After Jordan Harris and Brandon Hawkins won a puck battle in the defensive zone to chip the puck up to Madden, he and Grant Jozefek went in on a two-on-one rush, with Madden electing to keep the puck and tuck a backhand home for the game-winner. It was a battle of Hockey East's elite all night long, with goaltender Cayden Primeau tying a career-high with 45 saves, including game-saving robbery in the final minute of regulation on Cale Makar, denying the Hobey Baker hopeful on a breakaway in the final seconds. Murray made 22 saves for the Minutemen at the other end. Jeremy Davies, a Hobey Baker hopeful in his own right, put the hosts up 1-0 midway through the game when he stole the puck in the defensive zone, sped in on Murray on a breakaway and ripped a backhand top shelf for his fifth of the year. The score stayed that way until John Leonard knotted the game at one during a UMass surge in the third period, beating Primeau on a feed from Ty Farmer behind the goal to send the teams to overtime. The road doesn't get any easier for the Huskies, who turn their attention to No. 11 Providence for a home-and-home set next weekend, beginning on Friday night at Schneider Arena.